To update you on things, The baby is doing well. We found out today that the doctors actually think he was born 6 weeks premature. So he struggled with sucking and feeding. He's been on a feeding tube and in the NICU up till this week. But now he's in the regular newborn nursery and he's weighing in a 6lbs 2oz. So he's still tiny but growing!! They think he'll get to come home this weekend. So I think we'll be picking him up either Sunday or Monday...maybe sooner. ?? I know this is going to be a challenge like no other. He has a daddy that wants to be a daddy to him but hasn't been able to live life free of drug dependance for the past 10 years. His mom, has had two previous children taken from her and now I'm sure is confused about her relationship with this guy, her future, her emotions, her body, her surroundings.. everything. Both are claiming to be placing their trust and faith in Christ and I think that He is the only One who can right these wrongs and bring this family together in whatever way that is to look like. Communicating with these two in prison is difficult. Right now, they are only allowed to write letters and send them snail mail. (not one of my strong points) So it's been hard to find the time and the words to say as we write back and forth. And Dan and I know that this child is ours to care for and to love but not nessisicarily to call our own. We hope that it may come to that if that is what is best for this boy and his family. So, I am thinking all the time of the fact that I want this boy to know he was loved from day one and welcomed even lovingly anticipated into our home! I want him to have the things that make up a heritage even from the start. But how do I pour into him all the things we've given our daughter so far knowing that he may leave and never remember them and also those things will have knit him deeper into my heart. I don't know how. But I do know I have to pour anyway and treat him as my son but know that he's not mine. I've said before that God taught me through Asher that our children aren't our own and that they are God's to be used however He seems loving and fit. But I don't know that it's supposed to be a lesson I learn and there, it's understood and applied to any child in my life, no problem. I think it's more of a daily thought and prayer that my soul murmers to God as I fall asleep and pray that my child is alive the next morning when I go to pick her up, as I buckle her into the car knowing I can't control other drivers actions, as I bring a newborn into my home who had a rough start and is still learning the basics of being a newborn, as my love for him grows with each feeding and milestone, as the thought of future pregnancies pop into my mind and the fears that come with those thoughts. Lately, I've been asking God to give me the faith to believe that He truly won't put on me more than I can bear. Some things I think about I don't know that I could bear and when those fears come I just tell God that if He wants to bring things into my life then He HAS to bring the grace and the trust as well and in abundance!! Writing all these things, I hope you understand that it's a way of preaching to myself. It's so easy to write it down... but I can go to bed here in 10 minutes and be plagued with the very fears I mentioned that God has control over. I hope I am not and I hope I can be filled with belief. I can write about fostering and the desire of our family to live out the gospel to the helpless, but Dan and I still argue about the situation and the fears and misunderstandings and lack of information that we have about the whole thing. We still have our moments of questioning if this is right for us. We still want answers and a clear plan of how this is going to go, and we act ugly when we don't see a green line popping out in front of us telling which way to go next. But God, (love those two words) being rich in mercy!!! He sustains us and gives us the ability to forgive each other, to not have expectations of others involved, to confess sin and fears to each other, to keep going every day trusting Him for the outcome. We have the pleasure weekly to sit under the pastoral ministry at Treasuring Christ in Raleigh, NC. Yesterday, in God's providence we were in Matthew 6:16-18 talking about fasting. We wanted to bring you a few of the things that were pointed out in this text, in order to aid your joy as you join us today in fasting for our baby's health. We thank you for joining us today in this and we expect to see god move in our hearts and lives through this. God grant you all joy in believing today! God is good! One of the benefits of trials is that you get the Joy of seeing God more clearly than you may have before. This is true of us today. We have just come home from a blessed week of vacation and it was a great time for us both to relax, love each other better and more intently, and to focus upon God. In one of our conversations from the week a great truth was discovered about prayer. One of the reasons we pray more during a trial is that we feel the need because it is pressing in on us. But we are no less needy at any point in our life and should always desperately anticipate God to do great things and to come through for us, for we need him to. 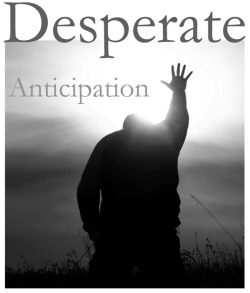 Our church, Treasuring Christ Church, is about to embark upon a focused time of prayer called "Desperate Anticipation" and it dawned upon us that this is exactly how we feel (and how we should always feel). We are asking all of you that know us and are following us through this time, to join us for a day of interceding prayer and fasting. We are asking this of you but not expecting this of you. Join us as you can and desire. We are going in for an Amnio on Monday morning at 10 am and this will tell us so much about what we are facing. We will find out finally what we are having and it will also serve to tell us if there are any trisomy or genetic issues. We believe that it would bring God great glory to show his power off before us and the medical world that has given us little hope. So we are asking God to heal our baby and we are fasting that His glory would be made known in this. We fast because we are desperate for God. We want to show him with the hunger of our bodies , not just that we want a healthy baby but that we are desperate for his presence and his power to be made known here. We are also asking God to help us and you that know us long for his coming more as a result of this trial. I want to thank you in advance for serving us with your prayers and joining us on Monday August 4th for this concentration on God. We love you all and are so thankful for the body! These are two CD's that I've been given recently that are so great and every mom should have them!! The songs are so precious and comforting! It's one in a series and it's scripture set to music.. with tunes that don't drive parents crazy!! Great for older kids but I know how early those little ones pick up songs!! I still remember scripture from songs I learned in Children's Choir way back when!! I was reading Romans 8 this morning contemplating how I would split it up for my students to memorize in the spring semester. I began this intending their good and ended up serving mine.The fact that my good was served is owing to the Holy Spirit acting in my heart upon the wings of God's Word (as my pastor would say). I have so many thoughts that occur to me as I read God's Word, observe culture, read theology and Christian books. Some of my thoughts are helpful to mention others are not and even the one's that are helpful can be jaded by my intentions, in the moment of mentioning. This thought, I feel is helpful. People often quote Romans 8:28 and why not, after all it has a comforting message. It occurred to me this morning that believing, and quoting this verse without loving the Gospel that produces it is both ironic and horrific. "And we know that for those that love God all things work together for good, for those who are called according to his purpose." I came face to face this week with the reality that my love for God is truly presumptuous at times, for I believe that His love for me must act in accordance with my idea of love. Now those of us who walk in theological circles would never say this is correct thinking but really ask yourself how often you practically live this way. The fact is I have been mad at God and many of you are saying right now, that is normal, true but normal is also sinful and it is not ok for me to be angry with God. The question is why the anger? Answer; I believe I deserve to be treated a certain way because I love God. So, without a correct belief in who God is or a belief in his gospel you will have defective, damming emotions as well. Paul goes on to articulate that this working of all things for good" is because God chose to know me, predestine me, call me, and justify me to the extent that nobody can be against me because He is for me (Romans 8:29-31).The Word pierced my heart reading the next verse, Romans 8:32 (not quoted as often). "He who did not spare his own son but gave him up for us all, how will he not also graciously give us all things." Because of the death of God's son I get God, the best of all things! I also get an amazing window that helps me see my deepest pain rightly. I do not know what the future holds for the life of my unborn child, and it hurts deeply to think that this life would be anything less than what we imagined it would be. But I do know and believe that the death of Christ guarantees the Fathers goodness to me. God is good at all times, but without the hope of the gospel I can not be assured on any level that my pain is working for me. Some would ask for more clarification on how God's goodness is at work for me in my trials. Milton Vincent, in A Gospel Primer for Christians sums this up with unreal clarity and this is something worth memorizing. My heart rejoices that these words are so true! More than anything else could ever do, the gospel enables me to embrace my tribulations and thereby position myself to gain full benefit from them. For the gospel is the one great permanent circumstance in which I live and move; and every hardship in my life is allowed by God only because it serves His gospel purposes in me. When I view my circumstances in this light, I realize that the gospel is not just one piece of good news that fits into my life somewhere among all the bad. I realize, instead that the gospel makes genuinely good news out of every other aspect of my life, including my severest trials (Romans 5:1-5). The good news about my trials is that God is forcing them to bow to His gospel purposes and do good unto me by improving my character and making me more conformed to the image of Christ (Romans 8:28; James 1:2-4; 2 Corinthians 12:7-10). Preaching the gospel to myself each day provides a lens through which I can view my trials in this way and see the true cause for intelligent rejoicing that exists in them. I can embrace them as friends and allow them to do God's good work in me. May God give us more grace to believe these things! We need this understanding to stick so desperately today.